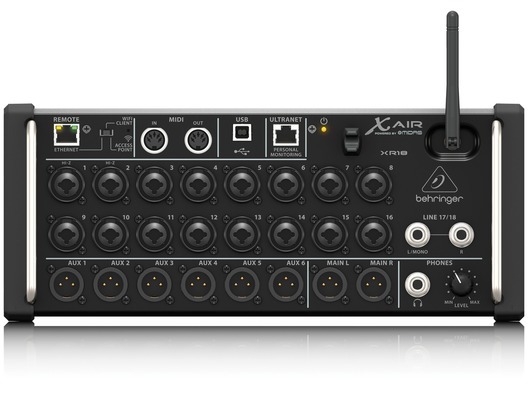 Ideal for both live and studio applications, the Behringer X AIR XR18 Digital Mixer is a powerful 18-channel, 12-bus mixer designed for use with devices such as iPads/Android tablets and laptops. 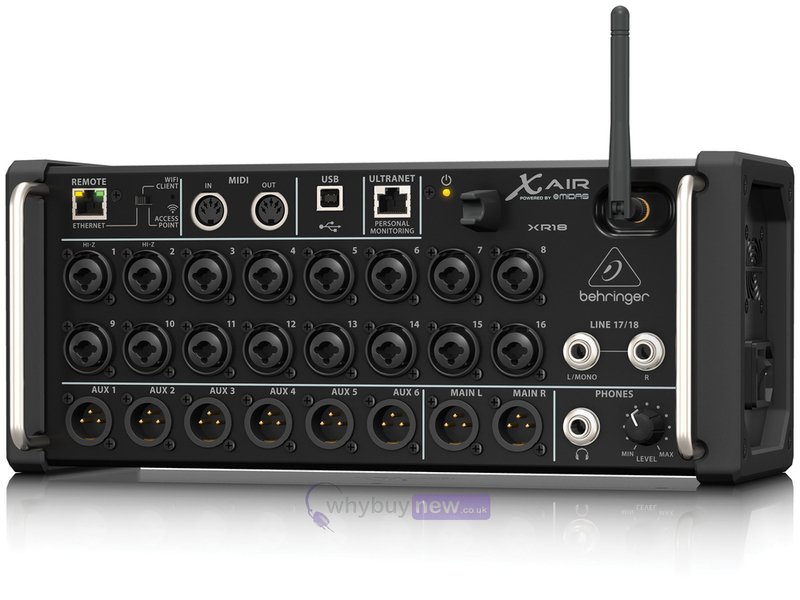 Made in the same mould as Behringer's hugely successful X32, it features 16 preamps designed by Midas, whose critically-acclaimed technology is sure to provide the best in audio quality. The XR18 also incorporates a Wifi module, which means that there is no need to set up an external router - it can connect to an existing Wifi network straight away. The Behringer X32 completely changed the game by rethinking what is possible from a digital mixer and over 100,000 users are enjoying the results. Now, that same technology has been incorporated into a small, but incredibly powerful, rack-mountable mixer that will forever change both the way you record and the way you play live music.The revolutionary XR18 is a powerhouse 18 input/12 bus portable mixer housed in an extremely sturdy stage box design for use with iPad and Android tablets. It is ideally suited for both live and studio applications, thanks to its 16 award-winning Midas -designed mic preamps, convenient integrated Wifi module for wireless control and a lightning-fast, bidirectional USB Audio Interface. The freedom to move around and manipulate all parameters of your mix with the free iOS, Android and PC apps lets you dial in the perfect sound from anywhere in the venue or the tracking room! Advanced engineering and meticulous design deliver stellar sonic performance at an extremely affordable price changing the game once again. Ever since its formation in the 1970s, Midas has had a long history of innovation and leadership in the world of audio mixing consoles. Employed by the most famous touring acts and installations worldwide, legendary Midas consoles such as the XL4 and Heritage H3000 quickly became industry standards.Midas has earned their impeccable reputation due to their no-compromise approach for audio and build quality and in particular for their award-winning Mic Preamps which are considered by industry experts as the industrys best sounding designs. Building on this legacy, the XL8 and PRO Series of Live Mixing Systems continue this great heritage of award-winning audio quality.Behringer is proud to incorporate Midas designed mic preamps for the ultimate in high-quality audio reproduction in both live and studio environments. Find out more about Midas amazing legacy by visiting their extensive website. Designed for the ultimate in mobility, the XR18 comes with an integrated Wifi module for direct control of your mixers functions without the need to setup and configure an external router. The XR18 gives you the freedom to focus on your mix, while allowing you to move about the venue to experience what every part of the audience is hearing. Plus you can adjust live monitor wedges from the artists perspective or better yet, let them mix their own IEMs and floor monitors via their own tabletsAccess Point is the easiest way to connect up to 4 clients directly and concurrently (i.e., iPad, Android smartphone/tablet or laptop). This mode should have your remote control up and running in less than a minute. The incredibly fast and comprehensive 18 x 18 channel, bi-directional USB interface makes the XR18 an amazingly powerful digital mixing solution for recording directly to your iPad or PC. Dial in the perfect monitoring mix with effects and zero-latency, while sending up to 16 microphone signals and the keyboard players MIDI notes to your DAW for recording.Whether youre making rock history in the studio, or you want to capture intimate live performances its never been easier to record stunning tracks with exceptional clarity.When Urei released the 1176LN Limiting Amplifier in the late 60s, it broke new ground. Field Effect Transistors employed were just invented, and the 1176 was one of the first audio processors to benefit from this new technology. Our digital reincarnation, ULTIMO COMPRESSOR, is based on the early Rev. E model, and authentically captures the smooth character of the original Class-A output stage and its FETs legendary fast Attack. (Inspired by Urei 1176LN*)The Fairchild 670 tube compressor not only achieves record bids in high-end vintage gear auctions, it also delivers some of the finest colorations in compressor history. Two small trim VRs preset the control side chain action, a six-step switch determines the timing, and the two large Input and Threshold knobs adjust the levels. The COMBINATOR is an amazing 5-band compressor that emulates famous broadcasting and mastering compressors. A highly complex processor, the COMBINATOR utilizes automatic parameter control that produces stunning and inaudible results. Makeup-gain for each frequency band will automatically be adjusted by the Spectral Balance Control (SBC) function, to maintain a balanced audio spectrum. EMT250* and Quantec QRS* etc.